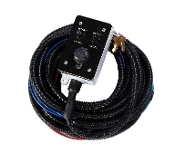 Replacement Control Panel for Automatic Systems If your old panel has a Rocker on/off switch instead of a system power button, you will need the entire Upgrade Kit #M37525. Features Manual Mode, All Up & Emergency Retract. This is a replacement control panel for the 2nd generation 5th wheel system (both version 1 and 2). Blue tinted LCD screen makes it easier to read in the sun than previous versions. This is the Standard Control Box(Gen. 2) for Single Point and Slave Systems. This Weatherproof Box has 2 push buttons for cylinder operation, a long wire harness and a lock & key safety mechanism (with two keys). Installation is a simple 3-wire connection to the tank assembly. This is the Standard Conrol box for the 2 Point Systems.... This Weatherproof Box includes a momentary toggle switch, long wire harness and a lock & key safety mechanism (with two keys). 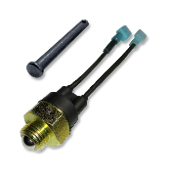 This Valve/Coil combo is a replacement for each corner jack on all EZ systems(both manual & automatic central pump systems). The only requirement is that it is an Oildyne/Parker Pump motor, this does not work for MTE or Monarch central pump systems. This is the standard 120 amp breaker we include in 4 Point, 4 Pump Systems. This is required to be installed between the battery harness from the jacks/pumps and the positive terminal on the house battery. 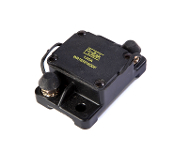 This 12 volt solenoid is what we use on all of our systems. If you have the older style (pre-2001) you need to buy a pair of these for each motor to work properly. Copyright © 2013-2019 Quadra MFG. All rights reserved.